This car is a must see, come in and schedule a test drive! All our vehicles are safety inspected and therefore qualify for warranty coverage up to five years on most vehicles!.We have over 20 years exceeding our customers expectations. Sales Tax, Title, License Fee, Registration Fee, Dealer Documentary Fee, Finance Charges,and Compliance Fees are additional to the advertised price. Call and Drive today! 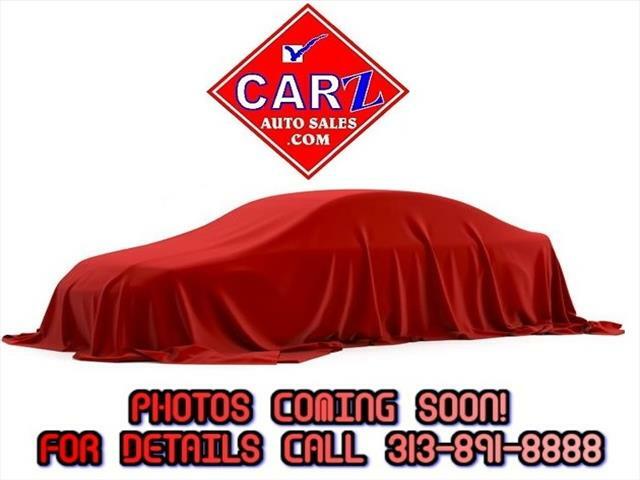 Visit Carz Auto Sales online at carzautosales.com to see more pictures of this vehicle or call us at 313-891-8888 today to schedule your test drive. Welcome to Carz Auto Sales. Be sure to visit our virtual showroom of inventory available for purchase. There you will see detailed information about each vehicle, a picture gallery, as well as convenient ways to contact us for more information about that vehicle. We are located at 125 W. 8 Mile Road and are available by phone at 313-891-8888 . You can also get driving directions and hours of service from our user friendly website. Email us at carz1one@comcast.net We are THE GOOD, THE BAD, AND THE UGLY CREDIT SPECIALISTS. Guaranteed approval. Come in and drive away. We also are the ZERO DOWN AND LOW DOWN PAYMENT SPECIALISTS. One stop no fuss. Drive Today!! Welcome to Carz Auto Sales. Be sure to visit our virtual showroom of inventory available for purchase. There you will see detailed information about each vehicle, a picture gallery, as well as convenient ways to contact us for more information about that vehicle. We are located at 125 W. 8 Mile Road and are available by phone at 313-891-8888 . You can also get driving directions and hours of service from our user friendly website. Email us at carz1one@comcast.net We are THE GOOD, THE BAD, AND THE UGLY CREDIT SPECIALISTS. Guaranteed approval. Come in and drive away. We also are the ZERO DOWN AND LOW DOWN PAYMENT SPECIALISTS. One stop no fuss. Drive Today!! Serving Detroit for OVER 15 years. our inventory of pre-owned vehicles is unmatched! Where else will you find with hundreds of used cars? CARZ AUTO SALES makes it easy to comparison shop from more than 20 brands. With so many vehicles to choose from, CARZ AUTO SALES makes buying a used car very easy. You can even see a full vehicle lineup online, to compare all kinds of available vehicles. Purchasing a used car from CARZ AUTO SALES gives you additional security. Many of our dealerships offer warranties, and certified pre-owned vehicles combine the value of a used car and the protection of a dealership's expertise and reputation. You may also be surprised how good of a deal you can get. Make sure to check out the specials for your favorite brand - and when you're here, ask about our financing offers. You might be able to drive away in a used car for less than you thought! Message: Thought you might be interested in this 2004 Pontiac Grand Prix.